An exhibition titled Tim Lai Ky Uc (Finding Memories) opened at the War Remnants Museum in Ho Chi Minh City on March 21. The museum and the management board of Hoa Lo Prison Historical Relic in Hanoi have organised the event to mark the 44th anniversary of National Reunification Day (April 30). 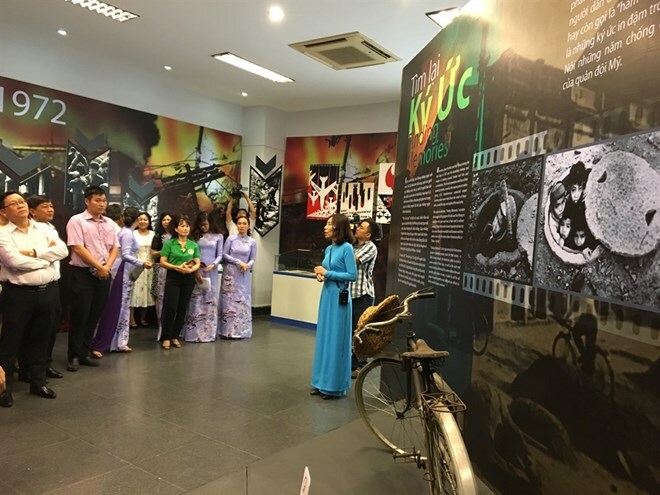 The exhibition showcases 250 photos, documents and memorabilia featuring four themes: Facing B52, Hilton - Hanoi, Coming Back Home, and Building the Future. The exhibits take visitors back to the 12-day historic battle against US B-52 bombers in December 1972, known as Dien Bien Phu in the Air. They recreate the struggle of people of Hanoi and Hai Phong who overcame sorrow and loss to achieve victory. The items also show the life of imprisoned American pilots during their detention in Hoa Lo Prison (nicknamed the Hanoi Hilton), and the release of American prisoners of war at Gia Lam Airport in Hanoi in 1973. Tran Xuan Thao, Director the museum, said the exhibition contains stories of imprisoned American pilots and the Vietnamese tradition of humanitarian efforts. “It is a chance for both local and foreign visitors to understand the humane spirit of the Party, government, military and people of Vietnam during the war and today,” she said. All exhibits are included in the 280-page photobook Tim Lai Ky Uc (Finding Memories), released by the management board in February. It was published by Cong An Nhan Dan Publishing House.